Just curious, don't you want blocking caps at input tx primaries for phantom? hehe thanks. Not too shabby. 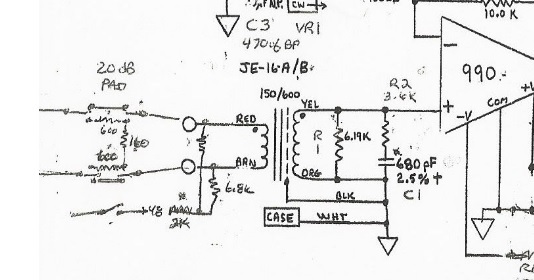 If you installed caps, they would block the 48V from exiting the preamp and then it wouldn't be phantom powering anything plugged in to it. If you want a more complete answer: the transformer doesn't care so long as you don't have a net DC current going through it. When phantom is off, then each side is pulled to ground via the 6.8K resistors, so the incoming signal rides up and down from the 0V midpoint (e.g. both sides of the transformer primary are sitting at 0V potential). When phantom is on, both sides of the transformer go up to 48V, meaning there is still no net DC potential across the transformer, hence no DC current across the primary. The input signal then rides up and down from this new 48V bias point. Again, the transformer doesn't care because it can only couple AC signals to the secondary, so whether it's biased at -50, 0, or +48V, it really doesn't care. Very much helped it snap into place. Thanks Matador! Edit: I thought any DC across a winding was bad. What does a 'DC-ruined'audio transformer sound like? Why can't you de-magnetize a tx so as to restore it? Now primary winding will behave same as short circuit because now there is no emf induced which opposes the supply voltage and it will allow heavy current to flow through the winding and will immediately burn the insulations and thereafter the winding. Across is the key word. Some transformers are designed to have DC current through them (aka. gapped), so saying 'any' DC isn't necessarily true. CJ had a lot of posts in the transformer meta so indeed it's a good place to start.